Let’s play a game. I’ll give you ten seconds to list 5 brands of whatever you can think of. Take a pen and paper and write down the 5 names. Ready? 3…2…1…Go! OK, so I’m pretty sure this wasn’t very hard, right? You were most likely able to think of 5 brands you know and maybe even love right away. And I bet while you were thinking of the names, you thought about the logos, too, right? That’s because unless you’ve been living under a rock, you can probably describe several company’s logos in the blink of an eye. Big brands like Apple, Nike, FedEx, Mercedes Benz, McDonald’s and Coca-Cola all have memorable logos almost everyone can easily identify. A logo is to your brand identity as your name is to you. Just as you introduce yourself to others by stating your name and shaking hands, your brand and business need something equally as memorable as a strong handshake: a good logo. Oh and please, if you’ve been thinking of coming up with a logo, don’t you think for a second to make an eyebrow and and an eye your logo. It’s so overdone. You won’t be memorable. There’s a reason you can look at this cupholder and immediately know what company’s logo is printed on it. Starbuck’s mascot mermaid is one of the most recognizable logos out there, yet, a mermaid has nothing to do with coffee. Unless there are myths I’m unaware of about hipster mermaids growing their own coffee underwater, the mermaid is just a symbol of the brand. How memorable would Starbuck’s logo be if they had a coffee bean instead of a mermaid? This is why you need to stay away from making your logo an eyebrow or an eye. It’s not memorable. It’s what everybody else is doing and a basic rule of thumb in life is that doing what the masses are doing won’t make you stand out. Instead, think of what you want your brand to be associated with and use that for your logo inspiration. Is your salon a luxury space where clients can unwind after a hard day at work? Then maybe consider a relaxing element as part of your logo. Perhaps a flower, or something zen. Is there an animal that you identify with that could represent your brand well? Maybe that’s your logo! Just keep in mind, a logo can be either an icon (like Starbuck’s mermaid) or your brand’s name styled, like FedEx or our Microblading Hub logo. FedEx’s logo is a wordmark type of logo. It’s the name of the brand, but there is one element about it most people miss. Once you see it, you’ll never miss it again, but it’s hard to spot the first time. Notice that the negative space between the letters “E” and “x” form an arrow. An arrow is part of their brand identity, as they are in the business of shipping. I always tell my clients to stop using their @gmail.com email for business. This is because it doesn’t look professional. When you are creating a business, you need to look the part. No better way to start looking like a serious business than by having a logo. A logo makes your company and your business look organized. It tells people you have invested time in creating something solid for them and that will inspire them to trust you. Trust is the absolute biggest factor in commerce. Without it, there is no business. It is the starting point of any successful venture. When your clients trust you they buy from you and recommend you to others. When you start your own business, you are creating a brand. A brand goes beyond what products you offer or what storefront you have. A brand is the company’s personality and what feelings they want to evoke in people. Take a look at Coca-Cola’s logo, for example. Coca-Cola is clearly going for a vintage look with this version of their logo. The vintage bottle and their institutional font evoke images of the early 20th century, especially the 50s. But, how do you market a soda? What kind of ads can you run that go beyond the obvious angle of someone drinking the product? Coca-Cola is a master in this. Their publicity is always about something greater than just a soda. They aim for community, family, bonding. Their most effective ads tell people that their product isn’t just a random soda. Instead, their product brings people together. It creates connections and incentivizes families to spend time together. In the more immediate part of it, having a logo will allow you to set some key elements of your brand: Your colors and your font. Your logo’s colors are going to become part of your brand identity. You should also pick a font and make sure all your use the same one for all your visuals. One of my clients recently used Tailor Brands to design her logo and she loved it. I have used it, too, in the past and loved the experience. The ways it works is that you answer a series of questions based on your style. They give two options of different aesthetics and you choose the one that best fits your brand. Then you select what type of logo you want: a word-based or icon-based logo. You get some proposals based on your answers and then you can even edit the one you like. 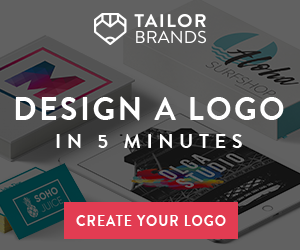 Tailor Brands offers subscriptions starting at $2.99/month. They really push the subscription and you can’t buy a logo without one, but you can cancel anytime and you retain the rights to use your logo even after your subscription has ended. 99 Designs is a classic in the design industry. They are the trusted provider of graphic design of successful entrepreneurs like Tim Ferris. You answer a series of questions on what styles you prefer. Then, you select your pricing plan. Prices range from Bronze at $299 to Premium at $1,299. All plans include a money back guarantee and you can expect at least 30 designs with the Broze and up to 60 with the Premium. After you select your pricing preference, 99Designs starts a contest based on your needs. They share it with over a million designers all over the world who will send you their proposals hoping to win your project. The contest is open 7 days, during which you can leave feedback and communicate with any designer whose proposal you like. At the end of the 7 days, you pick the winner. The designer gets their money and you get to keep all rights for your logo. Vistaprint, the printing giant known for their business card design service, also offers custom logo design. For $120, you get 3 logo options, 3 revision rounds, a fast turnaround and 3 final files. We love Fiverr for all of their affordable design options. They’re well known in the industry for offering unbeatable pricing for their designs, starting at just $5. With Fiverr, you choose which type of logo you like first. You can choose among several styles like signature, watercolor, hand drawn or vintage. After you choose your style, you set your budget, starting at $5 to upwards of $105. You then choose when you’d like to have it by, up to 3 – 7 days. Fiverr then takes you to a page displaying selected designers profiles. You can see their previous work, specialties, country where they are based and what previous clients had to say about their services. Browse to your heart’s content and settle on a designer you like. You then correspond and get your design! Alright, dear readers! These are our recommendations for logo design. Have you already settled on a logo? How was the selection process?